New York, NY : Grove Atlantic, 2017. Long-time readers will know I don’t love short stories. I like my books long and complicated, the more description and backstory the better (hello, Charles Dickens!). Yet one cannot ignore the stellar short stories collections out this year. I started the year with Roxanne Gay’s Difficult Women and moved into Viet Thanh Nguyen’s collection of short stories. I am so glad I did. Each one of Mr. Nguyen’s short stories is a microcosm of what I love about reading. The characters are real and surprisingly well-developed in spite of the brevity of their stories. Their everyday lives are memorable in their mundanity. Their stories are equally unremarkable. Yet, they are captivating in their normalcy. The Refugees is a collection of stories about the people who left behind their lives in a war-torn country to start fresh in a new one, sometimes at great peril, in a country that will provide them more freedoms than they ever could have had should they have stayed. These are the stories of people who represent just one more generation of people seeking refuge on our shores, who remind us all of the original settlers in this country. Mr. Nguyen’s ability to drive to the heart of each of their stories in a few short sentences embodies each word with significance. His prose makes the entire collection immensely readable. You find yourself drawn into each story, compelled to keep reading, and highly disappointed when it ends. Yet you move on to the next story to find yourself fully engaged once again. A section called “The War Years” has a story that is not actually about the war we usually think of. We’re in L.A., in Little Saigon, in a grocery store where we breathe in the smell the dried cuttlefish and star anise in the crowded aisles. Father (Ba), mother (Ma), and Long (do I need to say? ), a thirteen-year-old for whom school, even summer school, felt like a vacation, worked at the store every day, even Sundays after Mass. This is a collection of 8 short stories by Pulitzer Prize winner Viet Thanh Nguyen. After reading these, I'm now much more inclined to pick up his winning debut The Sympathizer. I can honestly say I enjoyed all the stories in this compilation. All of them are about the experience of leaving one country for another, but each story was unique. They are about culture and identity but I really loved how they examined relationships - between parents and children, husbands and wives, between siblings - with great insight. My favorite was "I'd love you to want me", which was about a devoted wife whose husband was suffering from Alzheimer's. Some humorous, some deeply moving, all written skillfully but in a simple manner, i.e. few words and yet still managing to create a vivid sense of place and complex characters. Definitely recommended. I know that short story collections are usually a hard sell, but I'm going out on a limb and saying this one will. 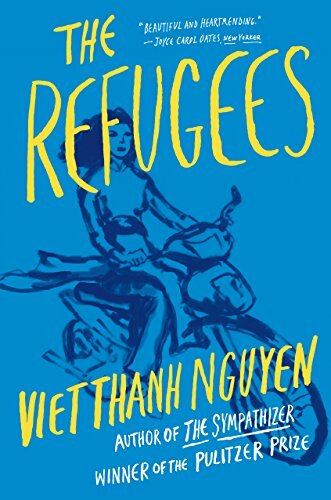 Viet Thanh Nguyen's THE REFUGEES is a sterling bunch of stories, eight of them, and not a bad one in the whole barrel. And I'm not surprised, because I've already read Nguyen's novel, THE SYMPATHIZER, which won the Pulitzer. Some of these stories were written ten or more years ago, but they already displayed the writing chops that were so evident in the prize-winning novel. And some of them, like "The War Years," with its widow sewing uniforms in a California barrio for a Vietnamese army that will rise again to defeat the Communists; or the former Vietnamese airborne officer who bullies and dominates his divorced son in "Someone Else Besides You," also show the early seeds that became THE SYMPATHIZER. "Almost everything looked more beautiful from a distance, the earth becoming ever more perfect as one ascended and came closer to seeing the world from God's eyes ... the peaks and valleys of geography fading to become strokes of a paintbrush on a divine sphere." "... tin-roofed shacks with dirt floors, a man pulling up the leg of his shorts to urinate on a wall... the air thick with blasts of soot from passing trucks, the rot of buffalo dung, the fermentation of the local cuisine that he found briny and nauseating." "Stories are just things we fabricate, nothing more. We search for them in a world besides our own, then leave them here to be found, garments shed by ghosts." These are hauntingly beautiful, wise stories, made to be read and remembered. My highest recommendation. I love short stories. They seem to be incredibly difficult to write, to put everything in just a few pages and connect to the reader as well. Done well, I find them incredible and that was one of the first things I noticed when I started reading this collection, the writing is fantastic. Excellent writing itself makes me want to trust the writer, puts me at ease, surely he knows what he is doing, he writes so well? Then the content, the situations presented have to draw one in, present a complete picture, make me want to continue reading. These did that too, and brilliantly. The stories in this collection have a common theme, as the title suggests they are refugees from Vietnam whom have made their way to the United States. They are all very good but two in particular I keep thinking about. One is War Room, a young boy, twelve years old is our narrator, his parents now own a grocery store and he must work there every day after school. He tells the story of a woman coming to the store to collect money to send to those fighting the Communists in Viet Nam, how his mother reacts and how and why her viewpoint changes as the story progresses. The second is I want you to want me, about a family with young children who escaped from Vietnam and have had a fairly successful life. The woman is our narrator, she works at her local library, a job she loves, go figure, but her husband is slowly sinking into Alzheimer disease and she is his main caretaker. What propels this story is that he begins to call her a different name, a name she has never heard of before, and the women begins to believe he had a life she knew nothing about. Taut and perceptive, this story is one that impressed itself in my mind. Don't quite know why. I have never read the much awarded novel, The Sympathizer, by this author, but will now make it a point to do so. The last book I finished in 2016 and it was a very good one. The eight stories collected here were published over a twenty year period. So there is an understandable variance in style, subtlety, and impact. The initial story, “Black Eyed Women,” is both the most recent and by far the best. That bodes well since it suggests that Nguyen is developing as a writer, but it means that the remainder of the book can come across as a slight disappointment after that first story. Better would be to see these more straight up, less challenging stories, as necessary stepping stones to something almost startling. And to be fair, none of the earlier stories are poor. Just weaker by comparison. Each of the stories involves Vietnamese refugees at some point. Nguyen moves easily between male and female protagonists as well as young and old. He appears to be a writer testing his craft. Again, this is something that improves over time. In some stories, the reader doesn’t realized the gender of the protagonist until a few pages in. And there is a sameness of tone across the stories, with the possible exception of the opening story. In all, this is a useful collection in order to get a view on where Nguyen has been the past twenty years. But I think the next twenty years will be much more exciting. [Viet Thanh Nguyen has written a collection of short stories called The Refugees and it's really good. While each of the stories touches on being a refugee or outsider, each is completely different from the others. And they are all really good. It's a slender book, and Nguyen clearly chose to only publish his very best. A quick read, audio was 5 hours long, read by the author Viet Thanh Nguyen. This a group of short stories about the Vietnamese, immigrant, refugee experience. The stories are varied and interesting. The author is a good narrator. A special thank you to Edelweiss and Grove Press for an ARC in exchange for an honest review. Viet Thanh Nguyen has been on my "to read" list for quite some time after hearing about the success of The Sympathizer (winner of several awards including the 2016 Pulitzer Prize for Fiction). This beautifully written compilation left me amazed and anxious to read The Sympathizer. I read this book while in Viet Nam. The short stories gave me a glimpse of what life is like for people who have had to leave their homeland. I enjoyed the humor as well as the emotions so clearly expressed in the actions and words of the characters. I liked this book even more than The Sympathizes. Something about it was too predictable and too smooth, felt like I have read it before.